Looking for unique gifts for children? 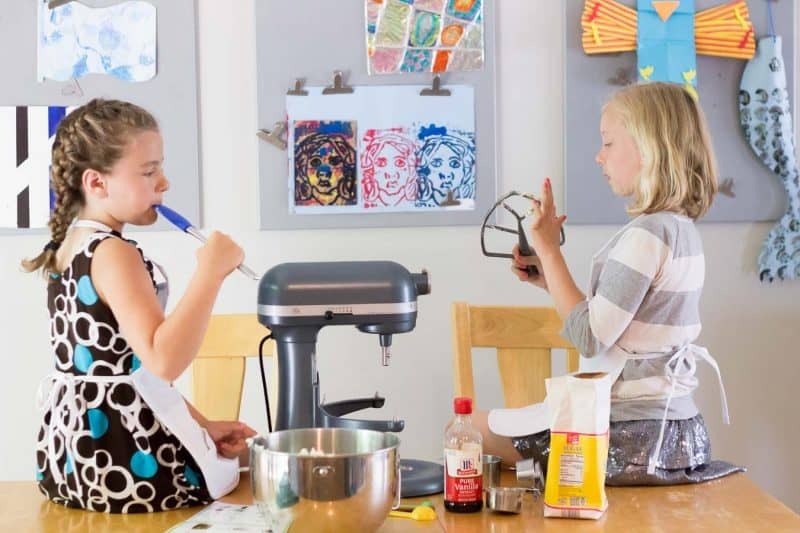 Does your kiddo love to bake or cook? 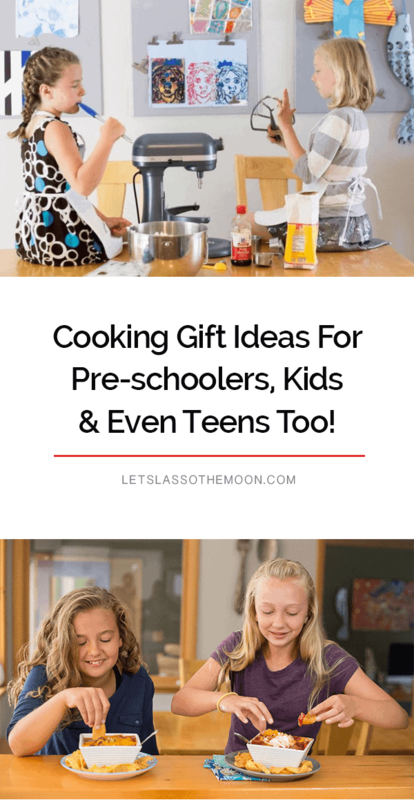 Skip just giving “stuff” and connect with these three experience-based gift ideas for kids (toddlers through teens) who love to spend time in the kitchen! Here’s the truth, I’m pretty sure this vintage avocado Kitchen Aid is the reason my teen girls still love spending the weekend at their Nana’s house. When my girls were little, they would squeal with delight at the idea of sleeping over at Nana & Papa’s house. While my girls still adore their grandparents, their weekend attention as teenagers is focused more on friends, practices, and everyday responsibilities. So how do you help YOUR PARENTS keep that connection — that grandparent squeal of joy — through the teen years? You get them in the kitchen together. A kitchen is a magical place for conversations, laughter, and connection. 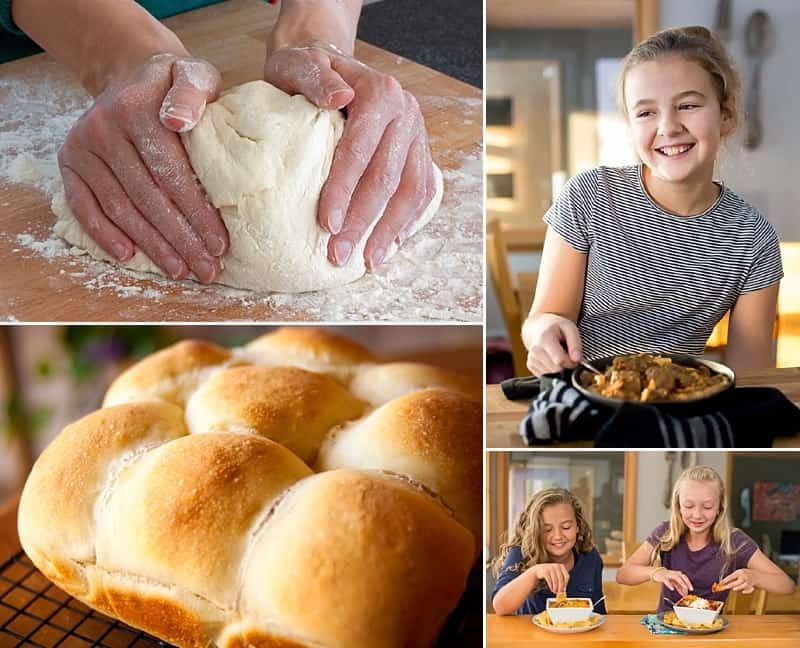 The gift ideas below will encourage your son or daughter to spend time with their grandparents in the kitchen. These three ideas will help your children open the door to a lifelong friendship with their grandparents, even throughout the teen years. Time with your family is truly a GIFT — Giving them your full presence is an act of love. Each of the cooking gifts below offers a present idea along with a presence suggestion. Below you’ll find ideas for fostering relationships with toddlers, tweens and teens. 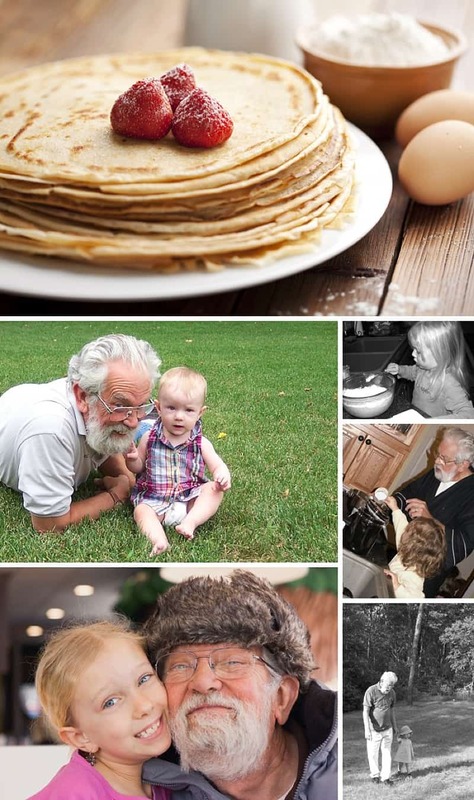 Here are three gifts for children that will encourage spending time with Grandma & Grandpa. *This post may contain affiliate text and photo links. If you purchase something through the link, we may receive a small commission at no extra charge to you. When kids are little, a wooden play kitchen is a must-give PRESENT for children. We love the Melissa & Doug Wooden Toy Kitchen in charcoal because it is strong, sturdy, and gender neutral (so you can pass it down between grandkids!). Start em young and then watch their love of the kitchen grow over the years. Once you’ve got a play kitchen, it makes future gift giving easy throughout the preschool years. We’ve always been a huge fan of all of Melissa & Doug’s wooden and felt food sets. They were a staple in our house as the girls were growing up. The unique twist on this gift idea? I suggest you leave the wooden play kitchen at Grandma and Grandpa’s house. Keeping the toy kitchen at Nana’s house ensure your kiddos feel their grandparent’s PRESENCE when playing. I cannot tell you how many wooden cookies and felt sandwiches my girls have served their Nana over the years. Having the wood kitchen set made it easy to shift back-and-forth between play and making real recipes when the kids’ attention spans were limited. The wooden play kitchen and toys helped foster a love of one-on-one time in the kitchen. My girls have enjoyed making Deutsche Pfannkuchen with their Papa since they were tiny! Don’t skip this suggestion! I know, sometimes cookbooks for kids feel like a waste of money, but not all cookbooks for kids are created equally. I highly recommend this specific PRESENT for your kiddos: The Ultimate Kids’ Cookbook: Fun One-Pot Recipes Your Whole Family Will Love! Over the years my mother bought our girls a kids’ cookbooks from reputable places like William Sonoma, BHG, and Good Housekeeping… but they’ve all ended up at Goodwill. 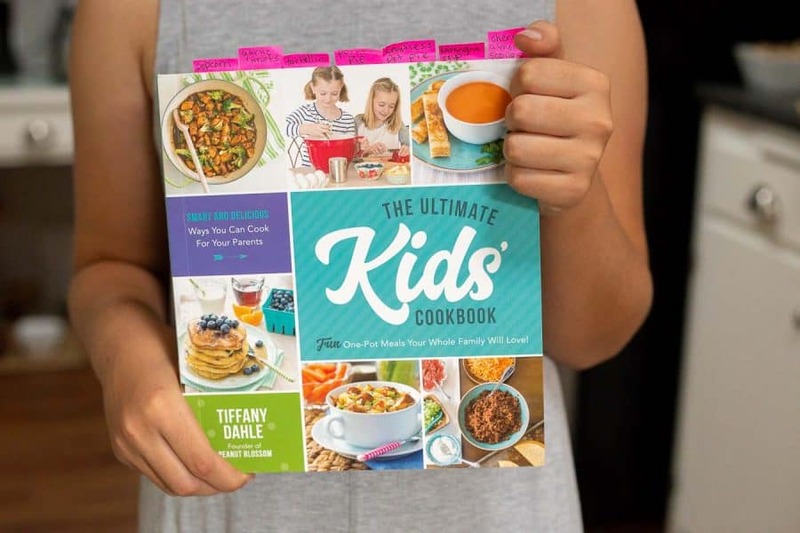 In my experience, kids’ cookbooks are generally filled with over-processed sweets, boring chicken tender recipes, or over the top Pinterest-cute recipes (that are actually too challenging for children, so they end up being disappointed). This cookbook for children, The Ultimate Kids’ Cookbook, uniquely fosters bonding with kids in the kitchen. The recipe instructions are broken down into specific tasks for kids and adults, creating a sense of collaborative teamwork in the kitchen. 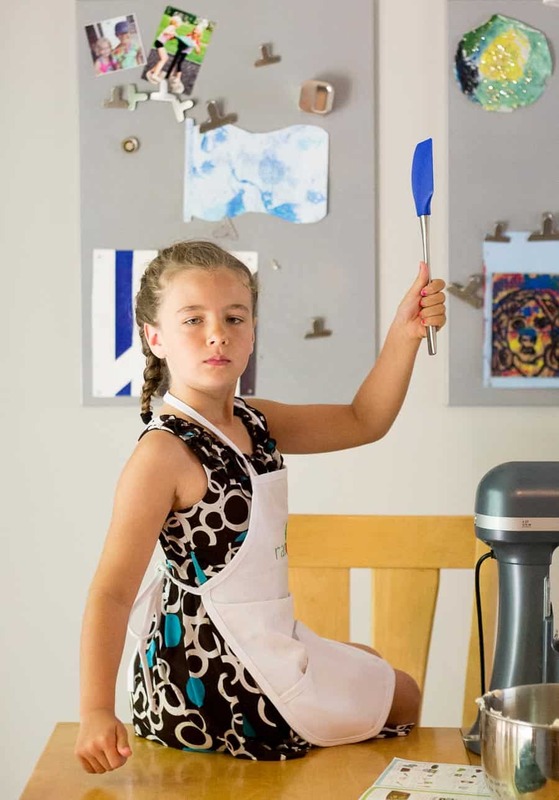 This specific cookbook puts the child in charge (making Grandma the sous chef), which fosters a sense of pride, responsibility, and independence. The kid’s cookbook goes beyond recipes offers an excellent skills set section with foodie challenges and resources. The book is AWESOME, but don’t take my word for it. This cookbook for kids has 5 out of 5 stars over on Amazon and 40+ reviews from different parents and grandparents. In other words, this is not just a collection of recipes, this specific kids’ cookbook is a tool for encouraging PRESENCE in the kitchen. This children’s cookbook can be gifted with cute coupons for monthly kitchen dates. I’d recommend getting two copies of the book, one for grandma’s house and one for home to make it easy to coordinate and chat about what challenge or recipe to tackle next. 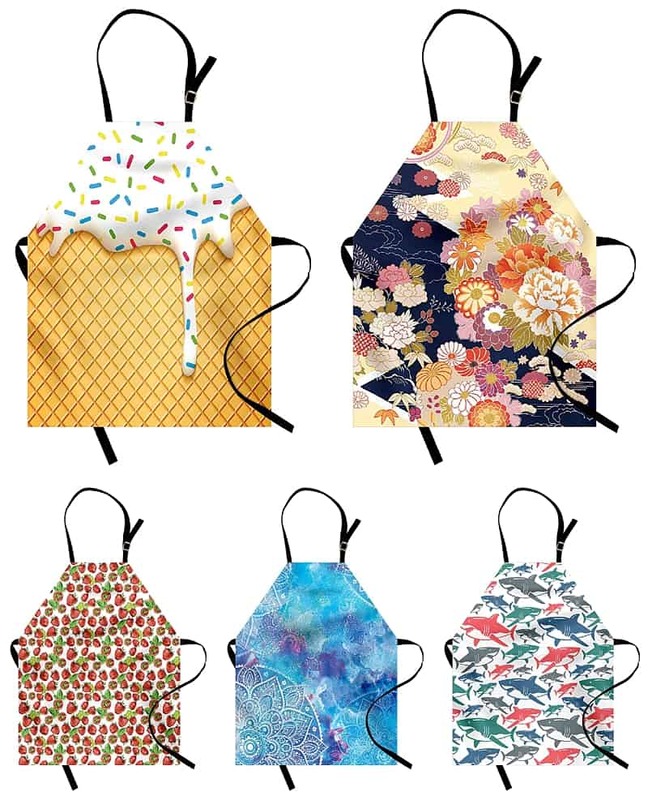 If you want to spruce this gift up, couple it with an awesomely unique Ambesonne apron and a set of metal rainbow measuring spoons and cups. Skip wasting money on cheap cutesy tools. Kids will love the dash of color in this set and the fact you’re taking them seriously as a chef! If you could manage to coordinate it, I’d suggest giving a Grandpa-and-me joint cooking class as a unique PRESENT for a tween or teen. Experiences over things! The truth is though, in this period of life, it might be hard to commit to an in-person cooking course with a rigid schedule. I am excited to share this alternative option with you. Help coordinate a monthly kitchen date between your kiddos and Grandma so they can take a video cooking class together through Craftsy. We are in love with the in-depth online baking and cooking classes offered through this site. Working through the lessons together is a great way to encourage PRESENCE each month. Cookie Decorating Season by Season – Be prepared for any season with beautifully decorated, colorful cookies. Smart Cookies: Better, Faster & More Efficient Decorating – Streamline your cookie decorating and create your best designs yet. *A good friend highly recommended this one! Homemade Holiday Breads – Master a dozen holiday breads to share with your loved ones this season. The Art & Science of Bread – Learn the “why” and the “how” behind your bread for perfect loaves every time. Craftsy offers so much variety! Pop over the cake, bake and cook sections of Craftsy for a full selection of course options. You can ensure you’re picking a class that is a good fit by clicking on any of Craftsy online courses for a video preview, overview, and lesson plan breakdown. If you’re feeling overly inspired and generous, check out Craftsy’s unlimited option called Blueprint. This annual membership gives you access to ALL of Craftsy’s online courses for a full year. 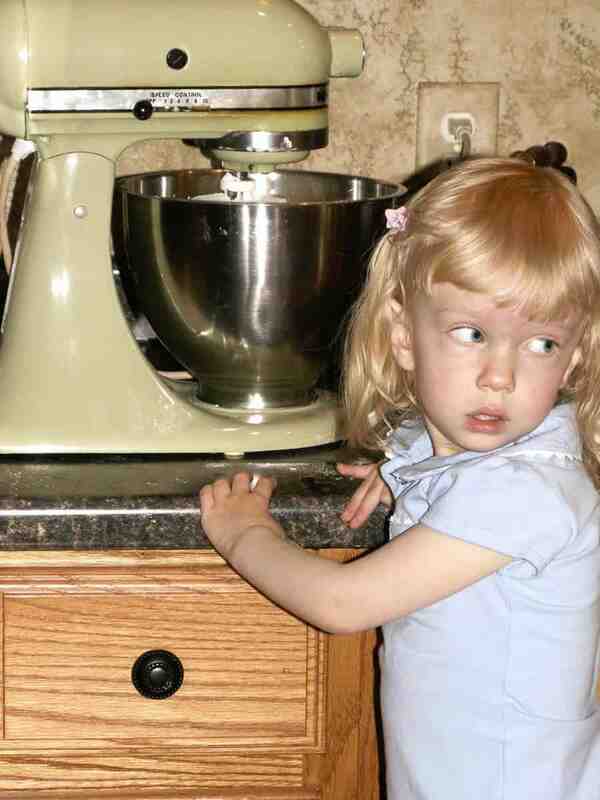 Did I mention that that avocado Kitchen Aid is our Papa’s mother’s mixer?!? In other words, it is old. I love knowing that a piece of history continues to bring future generations together in the kitchen. I truly believe the kitchen is a magical place for bonding. I hope you’ll consider one of these experience gifts for your special kiddo.